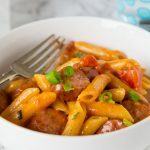 One Pan Cheesy Sausage Pasta - get dinner on the table with these easy pasta recipe. Just one pan, 20 minutes, and you are done! Heat a large skillet over medium high heat. Add oil, swirling to coat. Add sausage and onions to the pan, cook for about 5-7 minutes, stirring occasionally. The onions should be soft and the sausage starting to brown. Add garlic and cook for 1 minute. Mix in tomatoes, pasta, chicken stock and milk. Stir and bring to a boil. Reduce heat, cover and cook for 10-12 minutes until the pasta is cooked.